The delicious-smelling Fruit range brings the freshness of summer into any nail bar or skincare centre. 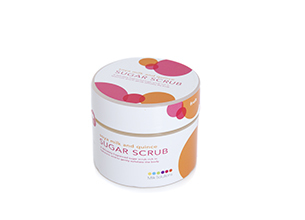 The Sugar Scrub is a delicately fragranced scrub rich in hyaluronic acid to gently exfoliate the body. I cannot count the number of body scrubs I have tried in search of ‘the perfect scrub.’ Majority of my searches have resulted in just opened scrubs being passed on to friends and family as they didn’t meet my requirements. They are always either too oily, too dry or too harsh. With this in mind, you can understand my joy when I find a scrub that meets my high ‘scrub standards.’ After trying the Milk Solutions Sugar Scrub, I’m on the fence about it. It has certainly intrigued me enough to use it again, however I’m not 100% sold. The tub holds a generous amount of scrub, which should last a good couple of months if you only use the scrub once I week as I do. The scrub itself has the perfect amount of oil to create a creamy texture when applied, but not too much that my skin felt sticky after rinsing it off. The granules in the scrub are fine enough not to be too abrasive, yet they still exfoliate the skin sufficiently. My only complaint about the scrub is the strong fruity smell. Considering the scrub is part of the Fruit range, the scent should be of no surprise, yet I was quite taken aback by how strong it was. I don’t have an aversion to fruit scented body products, but I prefer a milder scent. Considering how well the scrub worked, I will continue to use it in the hopes that the scent grows on me. If you like fruit smelling body products and you want to get your body beach ready for the summer, then this is scrub for you! Speaking as a scrub-a-holic myself, I have to admit, I would pay good money for a good scrub. I will definitely keep this one in mind… common Pay day! Wow I really love this products as it smells so nice and refreshing and removes all your dead skin and it makes your skin feel alive after using the product.